Quality Moving and Packing strives to be the best mover around,winning the highest award there is (Torch Award) with the BBB of eastern/northern Ontario and Ottawa in 2013 as well as no complaints award for the past 15 years, in June of 2016 and being nominated again for the Torch award for 2017. If you're searching in Ottawa, ON for local or long distance moving companies, Quality Moving and Packing is the most experience owned and licensed option in Ottawa, On. We also serve surrounding local areas like Orleans, Barrhaven, Kanata, Riverside South. Whether you require residential movers or commercial moving experts, let us show you how professional and easy we can make your moving experience. With our excellent reputation and years of experience, we are proud to be your full-service moving company. If you are planning your upcoming move, let Quality Moving and Packing Ottawa to handle every detail of transportation, storage, packing, and moving your belongings to your new home. Our services include packing and unpacking, moving, move management, and single item delivery, and each service can be scheduled. Our committed team of honest, hard-working movers will treat your belongings as if they were our own. We are committed to making the moving process as stress free and easy as possible. Quality Moving and Packing Ottawa provides you with information for Local, Long Distance, Residential moving, and Commercial moving services in Ottawa, ON. Our professional Ottawa movers are trained to handle local and long distance moving, piano move include packing, unpacking, furniture disassembly and reassembly, custom crating of fine art, marble and antiques. 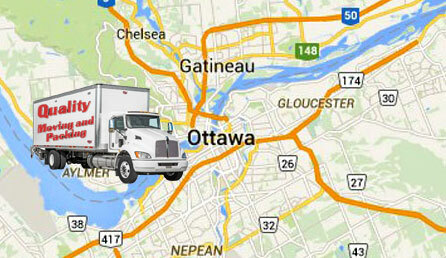 Quality Moving and Packing Ottawa will assist and create the most comprehensive office relocation moving lists for you. Our crew supervisors will also schedule a walk through with you to get specific details on how you would like to complete your move.